In Pakistan people are addicted of tea but there are only a few who are aware of the miracles of green tea. People show resistance to switch from normal to green tea but after knowing the magics of green tea one must think to add it his life. AICR's most recent international conference unveiled new findings on the cancer-fighting power of green tea. Research now shows that a major component in green tea may short-circuit the cancer process more extensively than scientists had realized. A number of laboratories are exploring green tea's cancer-fighting effects on a cellular level. "A unique quirk of biochemistry allows green tea's protective effects to extend to many different kinds of cells," says Dr. Gasiewicz. "In fact, one of the active green tea substances - called EGCG (epigallocatechin-3-gallate) - seems to target one protein that is common throughout our bodies. And it does so with a degree of precision that cancer drugs still aren't able to match." This protein is called HSP90, and it is present at high levels in many cancer cells. Scientists believe that, in some circumstances, HSP90 helps to trigger the series of changes in cells that eventually lead to cancer. However, when green tea's EGCG binds to this protein, it helps to prevent these changes from happening. "EGCG targets HSP90, binds directly to it, and keeps it from passing on signals that can start the cancer process," Dr. Gasiewicz explains. "As a result, potentially harmful genes are less likely to get turned on." This is important, because HSP90 is present in all of our cells. "If further research confirms that EGCG's ability to bind to such a basic protein enables it to provide protection throughout our bodies, it explains a scientific mystery," says Dr. Gasiewicz. "Studies that track the diets of human subjects over several years - particularly studies conducted in Asia, where green tea consumption is common - have associated regular usage of green tea with lower risk for cancers that are vastly different from one another." Asian data links green tea to reduced risk for breast, prostate, bladder, colon, stomach, pancreatic and esophageal cancers. This new finding shows that EGCG may be effective against an important "common denominator" for many different cancers, at the very start of the cancer process. Japanese and Chinese people drink an average of 3-4 cups of green tea daily, per person. According to the AICR survey, less than 1 percent of Americans are drinking the equivalent amount (roughly 2-3 American-size cups) of green tea. 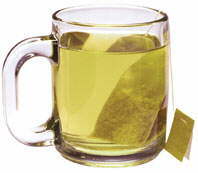 Nearly 7 in 10 Americans (68 percent) said they drank green tea rarely or never. By comparison, a recent scientific study reported that only 8 percent of Japanese people say they drink green tea rarely or never. Try to add green tea in your daily diet to prevent yourself from various diseases and also to enhance your immunity power. Different tea brands are offering green tea in Pakistan. Making a cup of green tea is as easy as adding a green tea bag in one hot cup of water. You can add sugar, mint leaves and few drops of lemon to enhance its taste. The devil is in the details. A majority of Americans drink the stuff that is dried and bagged. They boil some water, drop it in and watch it turn yellow, and that is all. There is no widespread "culture" of tea: the freshness and detailed preparation of it which I think is important.